Hampton, Va. - Hampton University President Dr. William R. Harvey and Mrs. Norma B. Harvey have given a $108,403 personal gift to HU to support a wage increase for all full-time permanent HU staff earning less than $9 an hour. Through this donation, 121 full-time, permanent HU staff employees will receive a wage increase equal to $9 an hour. This increase took effect Jan. 1. The Harveys have made two similar donations to the University in the past. In June 2011, they donated $166,000 to increase staff wages to $8 an hour and in July 2006, they made a donation of $45,000 in support of a five percent increase to staff earning less than $7 an hour. 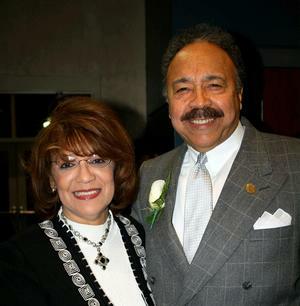 Also in May 2011, the Harveys donated $1 million to HU to be utilized as incentives to increase faculty salaries. This was in addition to the $1 million they gave in 2001 to provide scholarships to students who wanted to become teachers. At that time President Harvey stated that without good teachers there would be no business executives, astronauts, scientists and the like. In total, the Harveys have gifted more than $2.3 million to the University over the past 13 years. “Over the last several years, Norma and I have made donations to increase the wages of hourly support staff. While everyone at Hampton already earns more than the minimum wage, we wanted to show our gratitude to those staff members who work hard and serve the campus behind the scenes,” said President Harvey.